In collaboration with Meridien Marinas, Cairns Regional Gallery initiated an artists-run space in some of the then empty shops at the Marina at Port Douglas in late 2010. Named 'Beautiful Art Spaces' the project provided studio and gallery space to around twenty artists, whose work and background varied. There were dress designer/makers, art glass craftspeople, photographers, jewellers, painters, textilers and a graphic designer, all of whom were required to open their premises to the public most days. To watch an artist at work is an experience that most locals and visitors to the town enjoyed. Now, sadly, to make way for tourist accommodation to be built on the site, the existing building is to be demolished. Artists have been asked to leave by the end of February and many have already done so. Port Douglas Artists invite you to a get-together and exhibition to say 'Farewell' to this interesting, if rather brief, period in our lives on Friday February 17 from 6 to 8pm. As well as being a farewell to the Marina space, the exhibition is the launch of my new venture into digitally printed silk wraps and scarves (printed in Australia, of course). 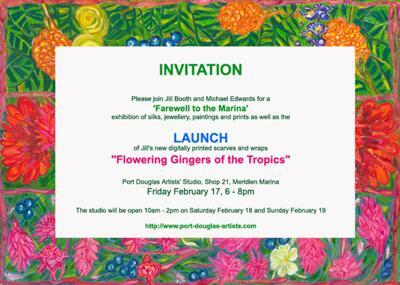 This series is about tropical flowering gingers and most of my research was done at the Cairns Botanical Gardens, where various species of gingers grow in wild profusion. There are three designs from which to choose (all long) as well as a sarong/wrap style. They will brighten up any outfit and are guaranteed to be of the highest quality. Numbers are limited so do come along and try some on (maybe wear a plain, darkish colour on the night?). We also thought we would have some fun playing with hitherto unseen lengths of silk and cotton mix (50/50) that I have painted/printed over the last year or two. The fabric is excellent to make into dresses and shirts for hot weather wear and is pretty tough as well as being luxurious. (Tachi will be on hand to discuss making your choice into garments if you are not an enthusiastic sewer). Michael has a small range of jewellery on display, much of it new work, so you may enjoy trying that on as well (plenty of mirrors!). He also has new paintings plus his ‘bottle people’, cushions and crocodile eggs. Sound like a good evening? Of course, if you are there it will be! It is always sad to see a beloved place close. But we always have memories of wonderful places and times plus so many friends.